I’ll be the first to admit, I’m not very good at cooking ‘simple’ or one pot/pan dinners. I go in with a simple idea and often complicate it by adding an extra dish or experimenting with a new technique and before I know it, I’ve used a billion dishes, pots and pans. I created this meatball recipe with the goal of creating a one pan dish and I’m pleased to say that I finally succeeded! This is something I make for the family once a week, loading up the tray with meatballs and homemade chips and then serving salad on the side. The leftover meatballs are perfect with an egg or two for breakfast the following morning or thrown together with salad or steamed veggies for a quick and nutritious lunch. Preheat oven to 180 degrees Celsius. Line a baking tray with baking paper and set aside. Heat the olive oil in a non-stick pan and sauté the onion and garlic for 5 or so minutes until translucent. In a bowl, combine all of the ingredients until well mixed. Form the mixture into golf sized balls (you should get 18-19 meatballs) and place on baking tray. Place the baking tray in the oven and bake for 20 minutes. Remove the tray from the over briefly, to turn the meatballs so they brown on the other side and bake for a further 15-20 minutes until the top is golden brown. Serve with salad and homemade chips, pasta/zoodles and sauce or eat with eggs for breakfast. The possibilities are endless! I have been making these patties for quick some time now, and created the recipe as a way of getting more calcium into my kids diet (we eat little dairy and don’t drink milk) and help the family move away from eating tuna on a regular basis (tuna is higher in mercury due to their large size). For me, eating tinned salmon with the bones and skin is the ultimate in reducing waste, using the ‘whole’ animal and boosting the nutrition of meals. One of the questions I get asked every.single.time when I talk about reducing consumption of dairy or encounter clients with dairy intolerances or allergies, is where will I get calcium? These salmon patties are an absolute sinch to make, my kids have NO IDEA there are salmon bones in them and you can make them in advance and reheat or freeze for another day. Enjoy! Heat a little coconut oil in a frying pan and sauté the onion, garlic and celery for 5 minutes or so. Place all the ingredients, except the coconut oil, in a bowl and combine until it all sticks together. Form into golf ball sized balls. Heat 1 tbs coconut oil in a non-stick pan and add 3-4 patties. Flatten with the back of a spatula and cook until golden brown and then flip to the other side. If they stick when trying to flip, you just need to cook that side a bit longer. I’m such a huge fan of bliss balls, they are a sinch to make and are a great snack for on the go. 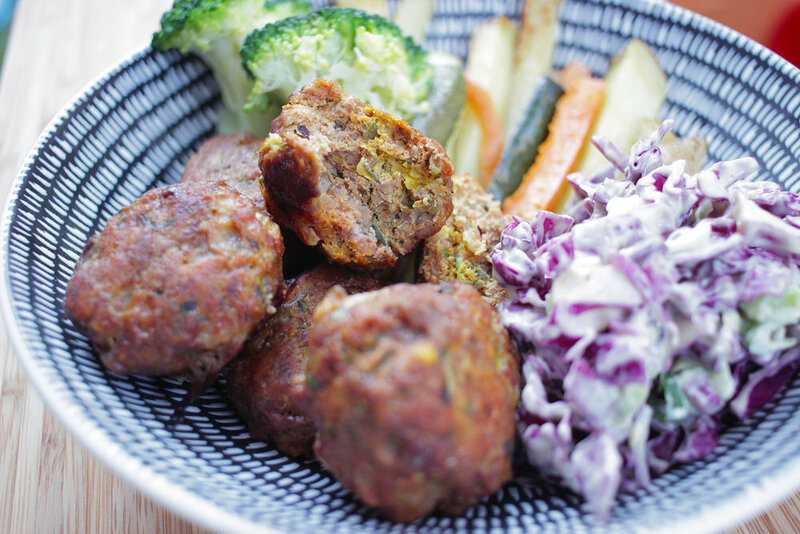 It’s easy enough to make them nutrient dense, loaded with good fats, protein, minerals and fibre. I prefer to keep my bliss balls on the fruit free and lower fructose side, firstly as I tend to eat thousands of them when they are super sweet, and secondly as I find I get quite a bad crash from the sugar high later on if they are loaded with dates and maple syrup or agave. I created this particular recipe to have an example of how to add hemp seeds to your day for my clients. I personally love hemp seeds sprinkled on dishes or added to smoothies, but found that others really wanted another way of incorporating them into snacks/meals. I’m a HUGE fan of hemp seeds as they are an excellent source of omega 3 fatty acids and are therefore great for those who don’t eat or don’t like eating fish. They are also a great source of other fatty acids (making them the perfect anti-inflammatory food), protein, fibre, minerals and B vitamins. They are also a sustainable food source and are grown here in Australia! Better still, they are finally legal for human consumption in Australia which means they are more readily available, I’ve even seen them in the big supermarket chains! Process the hazelnuts, in a food processor/thermomix/blender until they resemble meal/flour (not quite nut butter). Chuck in the remaining ingredients, except the coconut, and process until everything is smoothish and sticking together, adding a touch more rice malt if the mixture is too dry. Divide and roll the mixture into golf sized balls. Sprinkle a handful of the desiccated coconut onto a plate and roll the balls into it until covered. These will keep for a 5 days in the fridge, and freeze well too. Vegemite is an Australian staple, but the downside of this spread is that it is packed full of salt, and made with added colour 150c from the manufacturing process of fructose, malt syrup and other sweeteners. It also contains unspecified 'flavours' - which can be anything from from a naturally-derived food (animal or plant source) or synthetic flavours made in food chemical laboratories. At Westside Renee and I prefer to make our own 'Vegemite' - it's easy to make, stores well in the fridge and the kids love it! Store in jar in the fridge. Makes 1 x jar. Keeps for 2 months refrigerated. Some people are not fans of tahini with sweets, but I LOVE it - the more fat the more satiating, IMO. When I was on a strict elimination diet while breast-feeding my youngest with food intolerances this was my go to sweet treat in the evenings when I was craving a little sumthin'-sumthin'. Tahini is made from sesame, so it's packed full of minerals like calcium and iron and also loaded with unsaturated fats to keep you feeling fuller for longer. Adding tahini to brownies was just my way of tricking myself into thinking I was giving myself a 'healthy' sweet treat - but really it's just because I love how it combines with there bitterness of the chocolate. Line a bread loaf pan with baking paper (if not using a silicon one). Otherwise coat liberally with coconut oil to prevent sticking. Melt chopped chocolate with 1 x tbs of tahini, salt and coconut oiling a double boiler over low heath. Continue to stir until well combined and then remove from heat. Combine raw cacao powder and arrowroot in small bowl. Mix with a whisk or spoon until the powders are well mixed and there are no lumps. Whisk eggs and coconut sugar in a large bowl until fluffy and smooth (about 3 mins). Spoon the liquid chocolate into the egg and sugar mixture, continue to whisk for another minute. Slowly add the arrowroot mixture to the bowl while continuing to whisk the mixture until a thick chocolate batter forms. Spoon this mixture into there prepared bread loaf tin. Stir together the maple syrup and 3 x tbs of tahini in a small bowl until thick and creamy paste forms. Dollop the maple tahini cream onto the top of chocolate batter and fold it into the top of the brownie batter with a fork to create a swirl-like pattern on the surface. Remove from oven and allow to completely cool before removing from the pan and cutting. I think its easy to say that we've all heard the drill about how good bone broth is for digestive health and assisting with gut healing. At Westside Wellness, we regularly recommend consuming bone broth to our clients and have our own bone broth recipe here. If you're vegan or vegetarian or don't really want to cook with bones, you might be wondering if there's something you can have that covers so of the many food as medicine bases that bone broth does, and the answer is yes you can! Part of why we love bone broth so much is that it's a natural source of collagen. Our bodies contain significant amounts of collagen (around 1/3 of our body is collagen), and we need it for making and maintaining connective tissue. One reason collagen is useful for improving digestion is that it improves the production of gastric acid. The other reason, is that it contains the amino acids glutamine, proline and glycine, which are required for repair and rebuilding the gut lining. While collagen is only found in animal foods, there are many plant based foods that contain those amino acids found in collagen, required for gut healing. There are also many plant based foods that contain other important nutrients for gut health and boosting immune function so that your body can heal itself. Here's a little about all the nutrients that you'll find in this broth and what they can do for digestion and gut healing. Acts as a natural fuel for the intestines, assists with the regulation of cells and their growth, and therefore repair of cells in our gut, and reduces inflammation. Glutamine is found in plant based foods such as legumes (lentils, beans, peas) and veggies like spinach, parsley, cabbage and beetroot. Assists with formation of collagen, wound healing, formation of connective tissue and regeneration of cartilage. Plant based sources of proline include cabbage, legumes (especially beans and chickpeas), buckwheat, alfalfa, peanuts and asparagus. As with the above, glycine is an important component of collagen. It also assist with improving digestion via its role in the production of bile, which is needed for fat breakdown. Plant based sources of glycine include legumes, spinach, kale, cauliflower, banana and kiwi fruit. Vitamin C is required for the production and storage of collagen. It also acts as an antioxidant and anti-inflammatory agent, both of which are critical with damage or inflammation in the gut. Vitamin C is abundant in plant based foods and particularly good sources include citrus, berries, capsicum, parsley, kale and broccoli. Zinc is also required for the production of collagen, but also assists with reducing inflammation, boosting immune function and also acts an an antioxidant. Zinc is found in many plant based foods, including sunflower and pumpkin seeds, spinach, whole-grains, legumes and mushrooms. Shiitake mushrooms are a potent source of amino acids (particularly lysine and leucine), polyunsaturated fatty acids, B vitamins, vitamin C and zinc. Shiitake, and other medicinal mushrooms, have been traditionally used for their immune-modulating/enhancing and their ability to enhance immune function and destroy cancer cells has been well documented and researched. Onions and garlic are a rich source of flavonoids, which act as antioxidants and assist with reducing inflammation. They are also loaded with a special type of dietary fibre (inulin) that acts as a prebiotic, helping to feed our gut bacteria. Both onions and garlic naturally antibacterial/microbial which is beneficial in improving gut health/healing where pathogenic bacteria or parasites might be involved. Ginger is a potent anti-inflammatory food and also improves digestion by increasing the production of gastric acid and soothing and calming inflamed or irritated guts. Miso is a salty paste made from fermented soy beans, rice or barley, or a combination of these. Due to the fermentation process, it is a great source of beneficial bacteria and a great addition to a gut loving diet. It is also a particularly good source of nutrients, including B vitamins, manganese, copper, zinc and protein. *if you're lucky enough to have access to fresh shiitake mushrooms go for it! You won't need to soak them either. Soak the shiitake mushrooms in 1 litre of warm water for 20-30 minutes. Keep the liquid, but take the mushrooms out and finely slice. Heat the coconut oil in a large pot, and add the onion, celery, ginger and garlic. Sauté for 5 minutes, until the onions are translucent. Add the remaining ingredients, except the miso, and bring to the boil. Reduce the heat to a low boil and cook for 2-6 hours. Remove the parsley, celery sticks and broccoli chunks. Drain the broth keeping the mushroom, cabbage and onion etc to use in other dishes (like soups, stews or stir-fry). Allow to cool until warm and then add the miso (too much heat will damage the bacteria). Ensure you allow to the broth to cool completely before refrigerating or freezing. You can eat this broth with the veggies in it, adding legumes or tofu/tempe for protein, or you can use it as a base for other soups/stews/curries. Keep small amounts in the freezer to have on hand when sick, to be sipped to keep hydration up. The possibilities are truly endless! We are gluten and dairy-free at our house due to our youngest child having food intolerances. Fortunately there are many wonderful recipes out there that can mean you can still enjoy foods like pasta and lasagne even when you can't eat gluten. I've adapted this recipe from The Healthy Chef and tweaked it for our household's dietary needs. I recommend making the basic recipe below and then once you've got the hang of this go ahead and adapt it to your own palate preferences. Soak raw cashews in water (or speed up the process by soaking in freshly boiled water while you start the cooking process). Place sliced pumpkin on a baking tray and sprinkle with ground cinnamon, nutmeg and prigs of rosemary/thyme if using. Drizzle with 1 x tbs of olive oil. Roast for 20 minutes until golden and pumpkin is cooked (roast for longer if needed). Heat remaining 1 x tbs of olive oil in a small heavy based saucepan while the pumpkin is cooking. Once the oil is heated add chopped onion and cook over medium heat until translucent and slightly caramelised. Add garlic, lentils and salt and pepper. Stir to coat. Add tomato passata and red wine. Stir together and reduce heat to simmer on low for 20 minutes to allow flavours to develop. Throw in chopped basil leaves at the end of cooking the tomato sauce. Sauté greens in a small amount of oil or water until bright green. Strain cashews and blend on high with water, nutritional yeast, salt and pepper until combined into a smooth paste. Assemble the lasagne in an oven-proof ceramic dish starting with pumpkin, then greens, followed by tomato sauce. Repeat and then top with the cashew paste. Bake lasagne in the oven for 30 minutes until cashew layer becomes a crust on top. In a lot of ways, I can't believe I didn't create this recipe sooner! It contains pretty much most of my favourite ingredients, and I bloody well love a hearty savoury breakfast! Although it seems indulgent and time consuming, I reckon that baked eggs is something you can enjoy any day of the week, as it only takes a few minutes to prepare and is then baked in the oven for 20 minutes. Prep it, wack it in the oven, get ready for work or your day then enjoy! Preheat your oven to 180 degrees Celsius. Grease a deep baking dish with a little olive oil and set aside. Place the sliced sweet potato into the baking dish, close together without overlapping. Crack the eggs on top of the sweet potato, fairly close together. Sprinkle the cherry tomatoes, drizzle on some balsamic vinegar, add a few cracks of salt and pepper and place baking tray in the oven. Bake for 20-25 minutes until whites are cooked and a glaze is over the whole egg. Add any of the additional toppers on top when serving. My family and I love pasta and eat some form of bolognese pretty much every week. I love making it because its a great way to clear out the fridge of any scrappy or limp looking veggies, and I can cram a ton of vegetables in there that my kids wouldn't normally eat. 2. It has eggplant in it. I don't know about anyone else, but I always buy eggplant and never get to use it because my kids won't eat where it has obviously been added. In this dish, it is completely broken down and hidden, but adds fantastic flavour. Eggplant are also a great source of fibre, copper and B1, as well as a good source of manganese, B6, B3, potassium and vitamin K.
This makes enough for 6-8 serves, when I make it I immediately freeze half for a quick meal later down the track. If you don't want to freeze it, just half the recipe. I hope you enjoy this meat-free Monday meal! Heat the olive oil in a large pot. Add the onions, garlic and celery and sauté for 5 minutes, stirring occasionally. Add the remaining ingredients and stir to combine. Fill the empty tin or jar of crushed tomatoes 3/4 full of water, shake it to loosen all the tomato-ey goodness inside and tip that in as well. Bring to the boil, then drop to a medium heat and cook for 30 minutes. Stirring occasionally. Add the chopped leafy greens and cook for another 5 minutes. To make this a completely hidden veggies meal, take to the pot with a stick mixer or potato masher and process until the texture is to your liking. When you are dairy-free, egg-free and gluten-free breakfast can feel like a real struggle. Some people turn to meat and veg for breakfast but when you are after something more traditional buckwheat pancakes can be just the ticket! Many women while breast-feeding undergo strict elimination diets if they suspect their breastfed child has a food allergy or intolerance. When undertaking an elimination optimal nutrition is really important - that's where pseudo grains like buckwheat can come in. Magnesium - a important mineral to support brain health, mood and energy. B vitamins - needed for energy, growth and healthy mood. Fibre - regulates blood sugar & fats and assist with moving stool along the digestive tract. Other minerals - such as zinc and iron which are critical to digestive health, cell repair and energy. I hope you enjoy this recipe and it becomes a family favourite like it is in our house. Chopped fruit or extra sweetener for serving. Grind the chia seeds in a coffee grinder or in a heavy duty motor and pestle. When using the motor and pestle, all up this process takes about 5 minutes (just grind until your hand feels tired, step away and then come back to grinding). Once the chia eggs have gelled add buckwheat flour, chia eggs, milk, olive oil, cinnamon, sweetener and vanilla essence (if using) to a food processor and blend on high for 3 minutes. Add coconut oil to a heavy based saucepan and place on stovetop on high heat. Once the oil starts to shimmer reduce the heat to lowest setting add about 1 generous tablespoon of the pancake batter to the pan. Heat until bubbles begin to show on the surface of the pancake. Flip the pancake and cook on the other side until golden. Place cooked pancakes to cool on kitchen towel to soak up any extra oil. Repeat process with oil and pancake batter until you have finished the batter. Slice up some fruit and serve with pancakes with some extra sweetener. 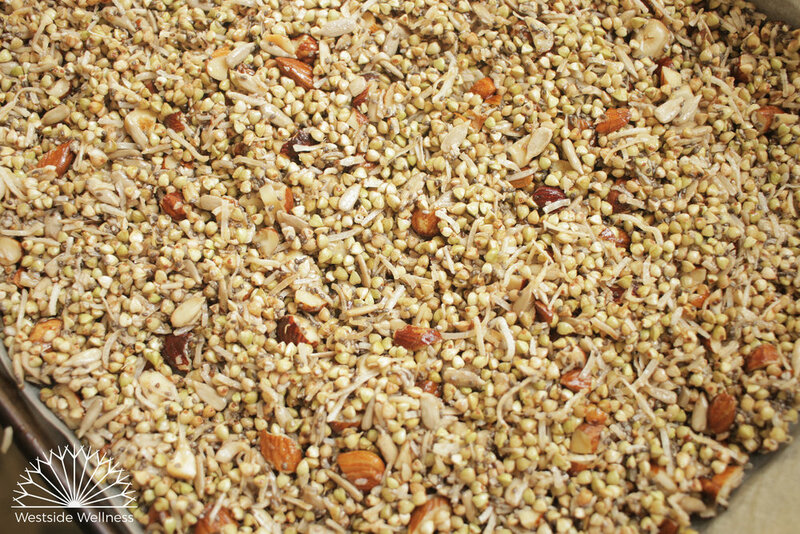 *Tip: any leftover ground chia meal can be stored in an airtight container in the fridge for 1 month. This easy to make spice mix can replace all those yucky (yet tasty) mixes that you can buy from the supermarket or in taco/burrito kits that often contain fillers, anti-caking agents and poor quality spices . You can use it in our chilli bean recipe here, or add to any of your own creations. We kept this 'mexi' spice mix recipe chilli free so that it is family friendly (and good for those who don't like too much heat!) but you can add cayenne pepper or chilli flakes if you desire. Enjoy! Store in an airtight jar, this will last up to 6 months. If there is one meal that I make that I can guarantee that my kids will eat, it is this one! My 2.5 year old particularly loves it and will usually eat 2-3 serves (yay!). I do this hidden veggies style by processing the mix before adding the beans in my thermomix, but it is just as delicious with chunky style veggies. You can also sub the black beans for red kidney or white beans, they all work well and have similar nutritional profiles. Heat the olive oil in a large pot or wok (using a wok works a treat!) over a medium heat, add the onions and sauté for 5 minutes until translucent. Add the garlic and all the veggies, except the leafy greens and cook for another 5 minutes. Pour in the crushed tomatoes, then half fill the tin with water and shake well (to remove all the tomatoey goodness) and pour in as well. Add the tomato paste, ACV, spices and 'mexi mix', combine well and cook over a medium heat for 40 minutes. Chuck in the leafy greens and process with a stick mixer/thermomix/food processor if you want to hide those veggies (I do!) and then add the black beans and cook for another 5 minutes. Taste and adjust seasonings if needed. Serve with cooked rice, quinoa or buckwheat, homemade tortillas or mountain bread and some chopped up lettuce. Other tasty additions include guacamole, coleslaw and slices of lime. 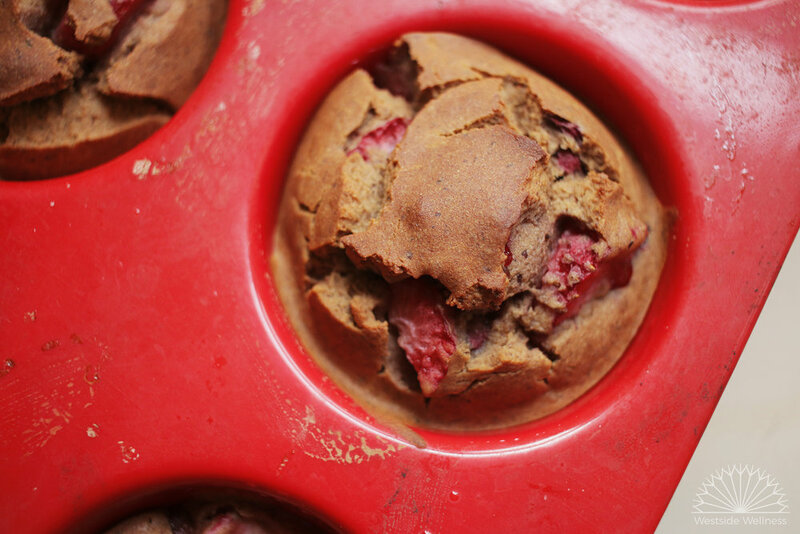 I've been working on a gluten free muffin recipe that was also egg/soy/dairy free (so it excluded the most common food intolerances that I encounter) AND wasn't too dense AND delicious. I knew I was onto something when my kids literally gobbled up the first batch that I made using the following recipe! As with all of our recipes, you can swap things like the gluten free flours for regular wheat/spelt/khorasan flour, the milk for any milk your prefer, the coconut sugar for regular cane sugar and the apple puree for banana (or even pumpkin puree). Preheat oven to 180 degrees celsius. Grease two muffin trays and place both on a large baking tray and set aside. Combine the apple puree, sugar, vanilla essence and coconut oil until well mixed. Add the flours, salt, baking powder and soda, salt, flaxeggs, cinnamon and milk and process until smooth. Gently stir in the chopped berries, then pour the mixture into the muffin trays (should make 10-12 muffins. Place tray in oven and bake for 25 minutes or until a skewer comes out clean. Allow to cool completely before removing from trays. Best stored in the fridge if not eaten within 2 days and they freeze well. This one is for all the mums who are breastfeeding child with allergies or intolerances. Why? Because I can still distinctly remember staring blanking into my pantry searching for a satisfying breakfast while undertaking an elimination diet for my 2-year-old's eczema and non-IgE allergies. Only a breastfeeding mum, 3 weeks into an elimination diet, knows just how much a pain in the bum preparing breakfast can be. If you are egg-free, soy-free, wheat-free, gluten-free, nut-free, oat-free and dairy-free breakfast you can feel like there's no safe foods to turn to - especially for breakfast when you can't reach for a simple omelette or muesli. That's where your seeds and gluten-free grains can come in. Staples like quinoa, brown rice and buckwheat are filled with minerals, proteins and starches to help you feel full, have regular bowel motions and give you plenty of energy for chasing your crazy kidlet around the place. My youngest has stopped breastfeeding but our whole family still continues to eat quinoa porridge for breakfast....because it tastes delicious! Want some more support with healthy diet options during your elimination diet? Get in touch book an appointment. If possible soak the quinoa overnight in the bowel with plenty of water. In the morning strain the quinoa in a sieve and rinse throughly. Place quinoa and the cup of water in a small pot on high heat. Reduce to a low heat and cook for about 10 minutes until most of the water is absorbed. On the low heat break the banana into pieces and add it to the pot with your choice of milk, the cinnamon and date if you are using it. Stir over low heat until the porridge is a consistency you like. Spoon into a bowl and top with slice fruit, crushed raw nuts and seeds. For quinoa I recommend you use tricolour or plain white variety as they make the porridge a creamier consistency. It's not critical that you soak the quinoa but doing this will release phytates from the seeds. This anti-nutrient compound can prevent the absorption of some minerals so soaking and rinsing helps to remove this from the quinoa. Safe milk may be coconut milk, almond milk, rice milk. I prefer to use maple syrup for a sweetener but you can use honey or rice malt syrup depending. Store any leftover porridge in an air-tight container to use for tomorrow's breakfast. 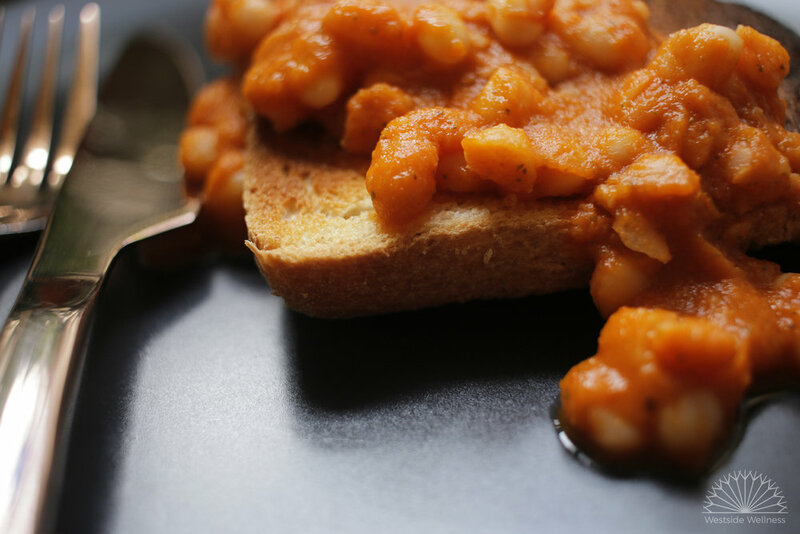 When I was a poor vegan student, baked beans were an absolute staple for me (realistically, they were always a staple, I love baked bean jaffles as a kid! ), and luckily for me they are a great source of protein because at the time I was uneducated about nutrition and ate very little protein. Fast forward a few years and I realised how much sugar and thickeners were in baked beans and instead of giving them up I decided to work on my own recipe that tasted just as good as store bought baked beans. Over the years I've tweaked this recipe to get to the one that follows, which I can safely say is one of my favourite recipes and is loved by my whole family. And I love how much they love it because I know they're eating veggies they normally wouldn't eat and are getting a great hit of protein, magnesium, iron, zinc and complex carbohydrates. I generally double this recipe and keep half for breakfasts for the week and the other half for more hectic weeks when I don't have time to cook. Heat the olive oil over a low flame, add onion and cook until translucent, around 5 minutes. Add the garlic, tomato paste, tinned tomato, thyme/marjoram, oregano, ACV, pepper and zucchini, combine well and cook over a medium heat for 15 minutes. Add the leafy greens, then allow to cool for a minute. Puree the mixture using a stick mixer, or by adding to a food processor. Place back in the pan, add the navy beans and cook for a couple of minutes. Will be good for in the coldest part of your fridge for up to 5 days, or can be frozen for up to 3 months. I love hot cross buns, and usually make a couple of batches around Easter for the kiddies because they love them too! But with my youngest being off gluten, dairy and soy and me not having enough time to play around with a gluten free recipe for hot cross buns, I decided to work on something a little easier and different, hot cross cookies! And boy, have they been a hit! They are soft, with a hint of spice and just the right amount of dried fruit. Easy to make, and easily adapted to suit any other intolerances, such as nuts or eggs. Preheat the oven to 180 degrees Celsius. Line two baking trays with baking paper and set aside. Cream together the eggs (or banana), sugar, nut butter, coconut oil and vanilla essence. Add all the remaining cookie ingredients, except the dried fruit, and combine until well mixed. Then add the dried fruit and mix in. Using a tablespoon, spoon the mixture out and form into golf ball sized balls. Place on the baking tray, evenly spaced (these will spread) and gently flatten with your hand or with a fork. Combine the ‘cross’ batter ingredients, adding the milk in 1/2 tsp increments, until smooth and without lumps. You want this mixture to be thick enough to squeeze through a piping bag (or drizzled over the cookies) and not too runny or it will spread. Pipe the mixture across each cookie, forming a cross. Place trays in the oven and bake for 15-20 minutes. Allow to cool completely before removing from baking tray. These are a massive hit in our house! I love making these chocolate popsicles because they are dairy free, low sugar and super quick to make! I can whip them up in the morning or early afternoon, knowing that in a couple of hours they will be ready, perfect for those hot days when you need to cool off AND keep the kids happy! If you need to keep them fructose free omit the dates, otherwise don't be afraid of the realistically small amount of sugar in them! Dates are also fibre rich which helps to slow down the absorption of sugar, and the addition of them in these popsicles adds a special sweetness and creaminess to the texture. You can also play around with the flavours, omitting the cacao and swapping for carob powder or keeping them vanilla flavoured. If there's a cashew allergy, swap for other nuts such as almonds or macadamias or omit altogether. In a food processor or blender, process the cashews until a paste is formed. Pour the mixture into popsicle moulds (I use these and these). Place in the freezer for 2 hours until completely frozen. You will need to run the moulds under hot water for a for seconds to remove from the mould. There is something sublime about slow cooked beef - it tastes so rich and is full of flavour. This recipe is no exception with it's intense spices, herbs and citrus notes. I've adapted the recipe from the wonderful Neil Perry who's recipes I cannot seem to get enough of. As always I recommend using biodynamic or organic beef to limit exposure to toxins stored in the fats of livestock. Also this recipe is not exact - you can play with the flavours to have fun while cooking - just add and subtract according to your own palate and what's spices you have on hand in the cupboard. 1 x 400g tinned whole tomatoes (or 1 x jar of BioNature organic tomatoes which we love at Westside!). Add all the chermoula ingredients to a food processor or blender and process until smooth. Marinate the beef in a large bowl covered in the chermoula for about an hour. Leaving it on the bench top covered during this time to allow the flavours to infuse. Place your dutch oven or large casserole dish brown on a medium heat on the stove top. Add olive oil and heat until shimmering. Add the beef (retain the remaining chermoula liquid in the bowl) and brown the meat until sealed on all sides (this retains the flavour). Add the tinned or jarred tomatoes to the remaining chermoula liquid in the bowl. Stir and then add this sauce to the beef. Mix well. Place the dish, covered, in the oven and cook for 2-2.5 hours. Check the dish once or twice to make sure that liquid hasn't cooked off and to stir the beef to prevent from sticking to the bottom. Serve this meal with brown rice or quinoa. Sprinkle the dish with chopped parsley or coriander before serving. I love a good cracker! Especially with homemade dip or a nut cheese like the phenomenal Botanical Cuisine cheeses. 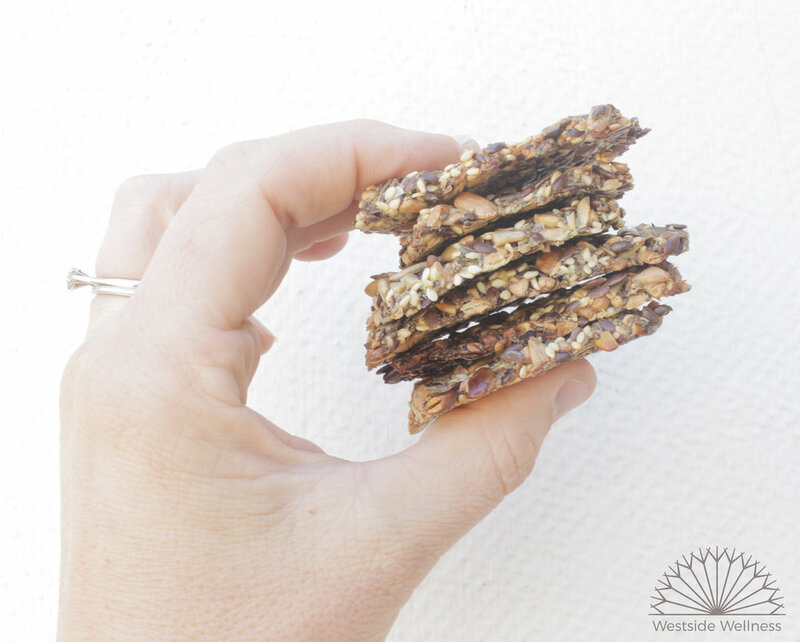 Seed crackers are a great way to get extra nutrition into your day, all whilst eating something delicious! These crackers are an excellent source of omega 3 from the flax and chia seeds, zinc from the pepitas and sunflower seeds, calcium from the sesame seeds and protein from all the seeds. You can whip these up quickly and have them on hand for whenever hungry strikes. They are also a great one to go for when you get that mid-arvo slump and want to reach for something sugary. Reach for these babies instead and stabilise your blood sugar and get an energy boost from the crunch, protein, carbs and healthy fats! 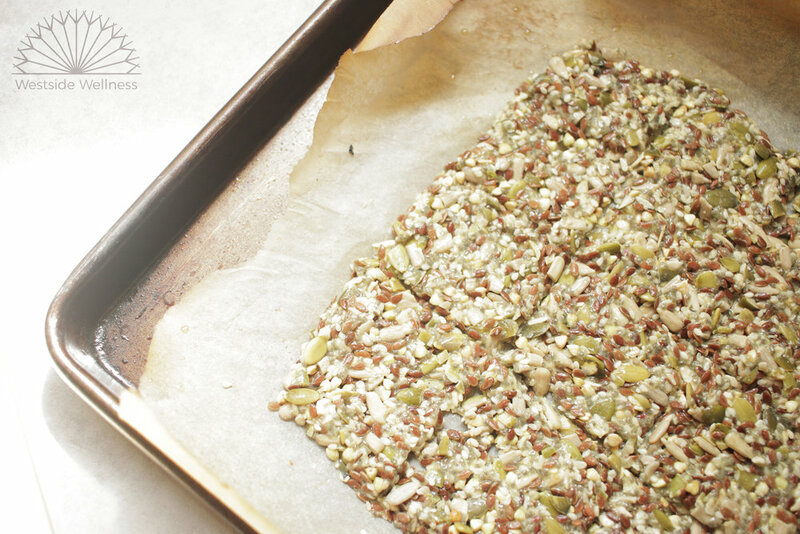 I hope you enjoy these tasty seed crackers, and check out our other recipes for dips to pair them with here. Preheat the oven to 180 degrees Celcius. Line two baking trays with baking paper or a silicone baking mat and set aside. Roughy chop the sunflower seeds and pepitas. Combine all the ingredients in a bowl and mix well. Allow to set for 20-30 minutes until the water has absorbed and the seeds have become gel like. Spread the mixture across both baking trays, ensuring it is evenly spread and not too thick (you want it less then 1/2 cm thick). Using a pizza cutter or knife, score the mix so the crackers will break apart easily once made (I usually make the crackers approximately 5 x 5 cm). Place the trays in the oven and bake for 20 minutes until slightly brown. remove the trays from the oven, allow to cool slightly then break the crackers apart. Flip the crackers over on the tray, place back in the oven and back for a further 15-20 minutes until golden brown. My go to breakfast pretty much 7 days a week is eggs in some form or other, but every now and then I really want crunchy granola with a bit of fruit and natural yogurt. I'm finding myself eating fewer grain based meals due to digestive issues, it really helps to cut down that stodgy and bloated feeling post eating that I often experience with things like oats. I'd been working on a grain free granola recipe in my head for quite a few months before I finally whipped out the ingredients and had a crack at making it, and boy is it delicious (and easy to make)! I have this as a snack in the arvo when I need a little pick me up as crunchy foods are great for improving focus and concentration due to the work of our jaws having to chump those harder foods, and the protein and good fats give that slow burn that maintains energy for the rest of the day. Preheat oven to 180 degrees Celsius. Line two baking trays with baking paper or silicon baking mats and set aside. Roughly chop the almonds and hazelnuts and place in a large bowl with the remaining ingredients. Combine well until thoroughly mixed. Scoop half the mixture on each baking tray and spread across thinly and evenly. Place in the oven and bake for 15 minutes, then swap the trays in the oven and stir the mixture around to ensure even baking. Bake for a further 20-30 minutes until golden brown. Allow to cool completely before placing in an airtight container.